The Snowy Range FFA Chapter held their annual degree ceremony in the Laramie High School auditorium. The degree ceremony was held on Feb. 12th during the ceremony they give out awards of two levels the Greenhand Degree and the Chapter Degree and they also have the speech contest. Receiving the Greenhand Degree was JJ Contois, Aspen Decker, Maxwell DeYoung, Emily Hayes, Torrin Hermann, Anistyn Holt, Samantha Hook, Kaitlynn Idler, Morgann Jensen, Kolton Lake, Felix Martinez, MacKenzie Muhsman, Keeley Puls, Madison Terrell, and Mayci Wade. Receiving the Chapter Degree award was Silja Alexander, Alisha Bell, Amelie Binning, Wyatt Bullock, Hunter Daugherty, Rylie Heggie, Craig Jackson, Ainsley Marshall, Abigail Mattimoe- Harris, Kenadi Olaveson, Ashley Predmore, Tanner Rogers, Selina Steiert, and Shaina Study. 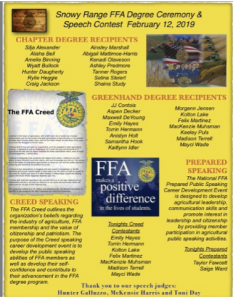 The speech contests were the FFA Creed and the Prepared Speaking. Doing the FFA Creed was Hayes, Hermann, Lake, Martinez, Muhsman, Terrell, and Wade. The prepared speakers were Taylor Fawcett and Saige Ward. The freshman and sophomore at LHS have been preparing since November to say the Creed. Each week they get a new paragraph to memorize and they start out saying it in front of the class then they work their way up to saying the whole thing. Memorizing the Creed is a challenge. “Having to remember the exact word placements and the motions,” Hermann said. Ward and Fawcett have also been working hard for several weeks on their prepared speeches that they both did very well on. “It went pretty good we both moved on and went to districts and we both moved on to go to nationals as well,” Ward Said. People who want to get more involved in agriculture join FFA, to be in FFA you have to be enrolled in an Ag class such as intro to Ag, Ag mechanics and/or Ag science. There are more Ag classes then just those three. There are many things to do in FFA, you can do a CDE which would be judging or other competitions such as vet science, Ag sales, parley pro, and many more things. The Judging involves horse judging, livestock Judging and meat judging. lso both Ag teachers at LHS. Coxbill teaches the welding and mechanic classes and Kunkel Teaches the science and business classes. Both the advisors are very involved with FFA, they always go support the groups though FFA and they both get along with all their students great and are very supportive. FFA is a great program to be involved in kids learn great new things through being in FFA If you want to know more about the FFA program or how to get more involved contact Kunkel or Coxbill through LHS or Snowy Range FFA.